The Shot Tower as a Symbol ~ The History Girl! I've written an historical novel, a history-mystery, that centers on an ancient structure in South Philadelphia that still stands. In the nineteenth century, the section of the city where it's located was an outlying province known as Southwark, a municipality that was taken in, with others, by the City's Consolidation. Some old-timers from South Philadelphia still know of the name Southwark. It is from the shadow of the Shot Tower that the story's main characters, friends Harry and Silas, emerge to embark on their Civil War America adventure. Though launched from Southwark, the story has a tri-state spirit. Harry spends time in New Jersey with his farm girl sweetheart. She crosses the Delaware River for the markets on one of several ferries, including the Kaign's Point Ferry, which had its New Jersey terminal at the river end of what is now Kaign Avenue in Camden, New Jersey. And Harry has a close call while on a ship sailing on the river that brings him on shore somewhere in Delaware. And the State of Delaware declaring loyalty to the Union, while keeping its slaves, is noted. Friend Silas's romantic interest appears later further south, where he has his own close call. The Sparks Shot Tower in Philadelphia has been standing since the import of shot into the United States was banned by the English, one of the causes of the War of 1812. 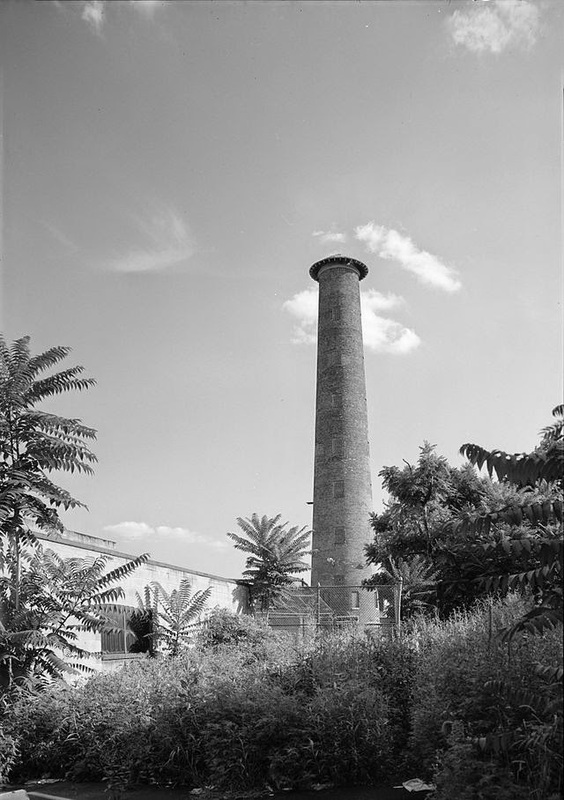 Two shot towers were constructed in the Philadelphia to make enterprises of shot manufacture. You can see the Shot Tower if you, carefully, look west while driving I-95. Going north, carefully, look to your left just after the sign for exit 22. Going south you'd begin seeing it to the right as you, carefully, approach the sign for exit 15. The Shot Tower as seen from I-95. Or if you're in the City, find your way to Front and Carpenter Streets. This is not a locale that finds itself on lists of historic sites. There may be open parking spots on Front Street. The process of shot-making involved dropping hot lead from the top of the tower. The lead would form spheres as it fell. The spheres would cool and harden when they splashed into a pool of water at the bottom. The Sparks Tower by the Delaware made shot until near the end of the Nineteenth Century. Around then it lost its original configuration was shortened and gained its conical hat. Early in the Twentieth Century it became the property of the City of Philadelphia and was made into a playground. My research for the story has been ongoing, part-time, for years, decades. I mark the official beginning as a conversation I had with my late father. He was a sportswriter for the Daily News, well known by the first name Bill. Shot Tower from street level. I grew up south of the Tower about fourteen blocks or so, Ritner Street, until I was 13. I would occasionally see the Tower on my wanders around the city. "Dad, what is Shot Tower?" "It was a Civil War watchtower." Though perhaps not wholly correct – we were not gun aficionados – it was a response that started my interest in the era. My book collection, the Free Library of Philadelphia, and the Historical Society of Pennsylvania filled in for much of the rest. Growing up on those streets, boys my age didn't engage in what you might call "gang activity." We were corner-boys. Third and Ritner was my corner. We and one of the nearby corners, Second and Jackson, occasionally played pick-up football games – tackle, of course – against the boys from Shot Tower. In the Shot Tower workroom, I attended a few rec center arts-and-crafts sessions. When I started writing, the Tower became a natural subject, an emblem for the narrative. 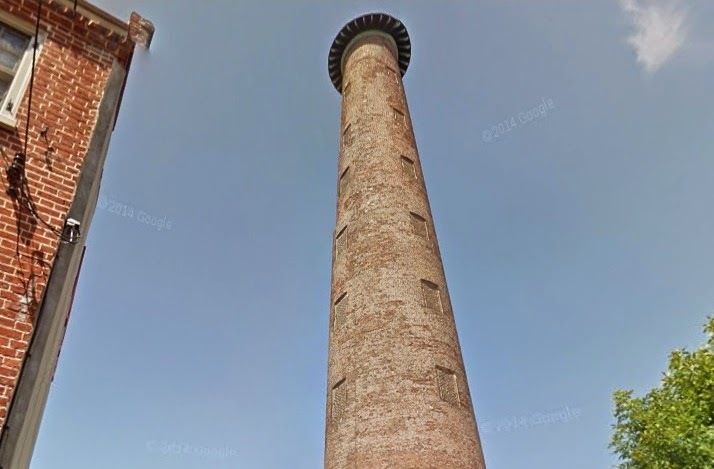 For me the Shot Tower was an image from my childhood. The main characters, two young friends, seemed to enter the story on their own. 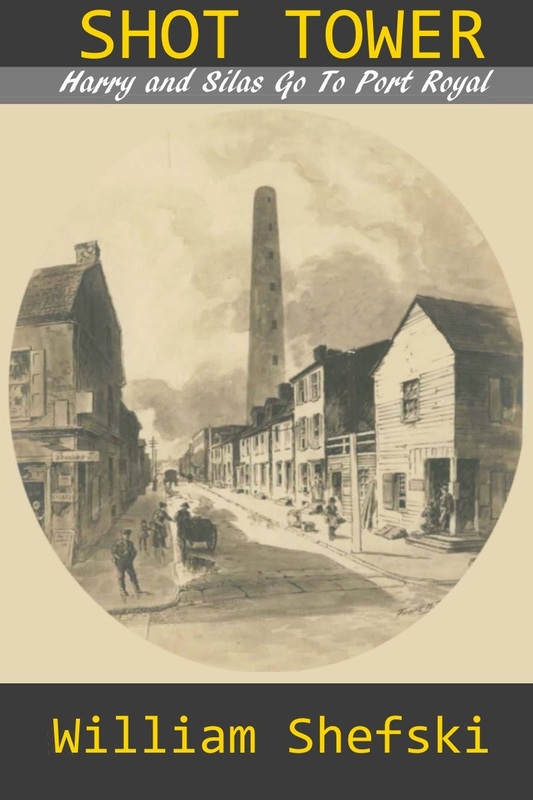 For nineteenth century Philadelphians, the Shot Tower represented self-sufficiency and completion of the Revolution against English rule. By the Civil War, the spherical shot was replaced in armed forces muskets as the most common ammunition by the Minié Ball, the bullet that was not actually a ball. In my story, the Tower represents the birth of a friendship. From the Tower's shadow, the friends's adventure is launched. With the indirect reference to the war that started my research for this novel, Shot Tower will always represent the freedom won for a population of enslaved Americans and the many Americans who fought and died for that freedom. The War Between the States is near eruption in 1860. Young Harrison Cormack, son of Irish immigrants, returns from a wander through Philadelphia to his home in Southwark to find his mother has been murdered. He becomes obsessed with finding her killer. Harry meets Silas Breed in the shadow of the Shot Tower, a riverfront landmark. They're recruited as scouts for the first United States intelligence service. They each find romance, Harry with Linnéa before departure and Silas with Acacia during the adventure. The friends search for the killer when they steam south as crew in the massive fleet that conducts the first major Northern naval action of the Civil War, the initial move in the Blockade of Southern ports. They observe the fleet enter Port Royal Sound and witness the assault, known to locals afterwards as The Big Shoot. Shot Tower is a history-mystery, a historical fiction with heart. It's Book One of the Harry and Silas Series. William Shefski was born in Southwest Philadelphia. He grew up in the Southern end of South Philadelphia. When he was 13, his family moved to South Jersey where he attended Haddon Township High School. After some time working in the food-and-beverage industry, at Head House Tavern in the historic area of the City and later at a Cajun restaurant in Virginia, he attended Temple University. There he studied film, television, and did course work in the History of Philadelphia. After graduating he began work in high-tech, starting as a technical writer. He acquired further skills and moved into consulting and application development. Now he writes science fiction such as the near-future story Dash in Orbit and historical fiction like the novel Shot Tower. Find out more about him at www.WilliamShefski.com.